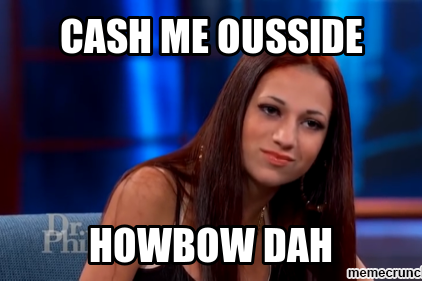 "Cash me ousside, howbow dah." A Philadelphia-based delivery company is using a viral star from exploitative monster television psychologist Phil McGraw's show in a new video advertisement. If you're unfamiliar with 13-year-old Danielle Peskowitz Bregoli, here's a brief history: She appeared on "Dr. Phil" in September 2016 with her mother because of her reported bad behavior. During her segment, she referred to everyone in the audience as a derogatory name for women, and McGraw asked her to clarify. Peskowitz Bregoli replied, in what I don't believe is the King's English, "Cash me ousside, howbow dah." Since then, Peskowitz Bregoli has become an internet sensation. She's the subject of endless memes and parody songs, and she's even trying to capitalize on her fame with merchandise. Anyway, goPuff, which was founded by former Drexel University business majors Rafael Illishayev and Yakir Gola, has tried taking advantage of the segment's popularity. In a new Facebook ad, a remix song using Peskowitz Bregoli's famous phrase is used to advertise goPuff's service of delivering everything from weed paraphernalia to snacks to cooking supplies right to your home. The ad has almost 350,000 views on Facebook. GoPuff recently expanded into Columbus and Pittsburgh, making it available in 15 cities across the country (Philadelphia and Manayunk are counted separately). You can use it in Philly for most of Center City, South Philly, University City and Manayunk. Also, Peskowitz Bregoli will be coming back to "Dr. Phil" next week. Watching her return show seems like a perfect time to order your viewing goodies via goPuff.